The Celtic tree of life(in Irish Crann Bethadh) plays an intricate part in Irish heritage and is among one of the most popular Celtic symbols. The tree of life and its symbol is featured in nearly all forms of history and religion. It symbolises both harmony and balance. In modern times this Celtic symbol is used for decorations, tattoos and tapestries. 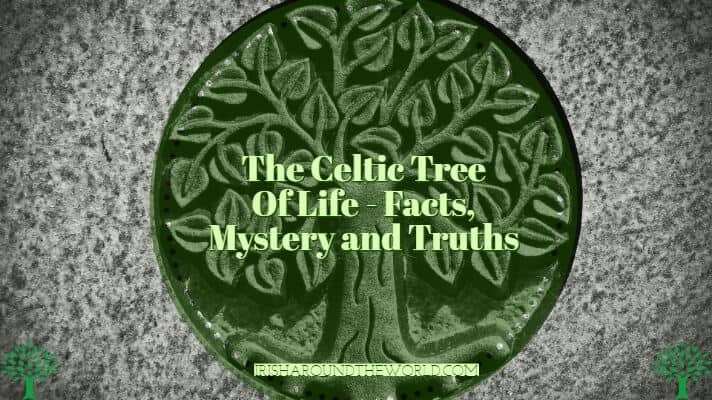 But what is the real meaning behind the Celtic Tree of life? To make things easier, I have bullet pointed some of the main points behind the tree of life. What does the Celtic tree of life mean? The Celtic Tree of life symbolises the forces of nature are coming together in perfect harmony to maintain balance in the universe. Trees were an important part of Celtic culture. The Celts believed that trees were ancestors of human beings. It was believed in Celtic mythology that the Celtic tree of life possessed special powers. People used to hold assemblies beneath it, and it also provided shelter, food and acted as a home for wildlife. Without trees, life would have been extraordinarily difficult. Trees were a connection to the world of the spirits and the ancestors, living entities, and doorways into other worlds. The most sacred tree of all was the Oak tree, which represented the axis mundi, the centre of the world. The Celtic name for oak, daur, is the origin of the word door– the root of the oak tree was literally the doorway to the Otherworld, the realm of Fairy. Countless Irish legends revolve around trees. One could fall asleep next to a particular tree and awake in the fairy realm. This is why the tree of life symbol itself relates qualities to it such as wisdom, strength & longevity. The Celts believed that their enemies would be rendered powerless if their sacred tree was cut down. The Celts derived the meaning of rebirth from the seasonal changes they would see each tree go through(Summer to Winter and so on). Rituals were often performed on the basis of birth and death and rebirth. Seen in the image below. It was believed that the roots of the tree penetrated depths of the lower world, branches of the tree reached out and stretched out to the heavens, and the trunk remains on the earth’s plain. It was believed that the tree was able to bless people with prosperity. The towering height of Oak trees is associated with qualities such as endurance and nobility. The Oak tree is also known to attract lightning, this characteristic of the tree is considered to be of great importance by celts and in Celtic symbols. As you can see the Celtic tree of life holds quite a big place in Celtic Symbols. Like the Celtic Cross, it is extremely popular in modern-day tattoos. In physical products, the tree of life appears in everything from jewellery to wall plaques. Some of you might dismiss the tree of life and what it represents as untrue. It is totally understandable, especially in a modern age. But keep in mind that all mythology no matter how bizarre originated from some truth. You can see another nine Celtic symbols here, and I will be writing a piece on each of them. Be sure to join my weekly dose of Irish email list to get notified when it goes live. My name is Kevin Muldoon and I love this can you please send me all the information on Ireland heritage. Really enjoyed the article and looking forward to more.